We are excited to be a member of the Charlotte community, in which we live, work, and play. From day one, we focused on creating a restaurant that is connected to the surrounding community. We hire locally and serve guests with the friendly warmth of a neighbor. We believe that hospitality and great service create memorable experiences for your friends, family and our TRUE community. We source our ingredients and products from nearby farmers, purveyors and distributors when possible. Our dough is made fresh every morning using a blend of local and organic flours and our pizza sauce is made with 100% organic tomatoes. We also go outside our restaurant and into the community to roll up our sleeves and help make a difference. A portion of every dollar brought into TRUE Crafted Pizza makes its way back into the community through sponsorships, donations, and in-kind contributions. We also participate in community events where we can bring our team out to help others. 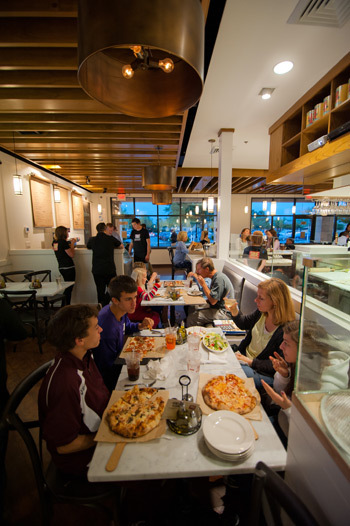 Beyond making great pizzas, we want to make a difference in our community. This is, and will always be, a driving force for us. For any community related requests, please contact Rachel Bowles at rachel@truepizza.com. We look forward to serving you soon!